Home Tags Posts tagged with "port trousers"
Once again, the wonderful team of Artesane share the second part of the trousers adjustments with us! Thanks so much! Now that you can alter the legs of a trousers pattern in your sleep, let’s focus on altering a more difficult area : the crotch. HOW IS MADE THE CROTCH OF A PAIR OF TROUSERS ? 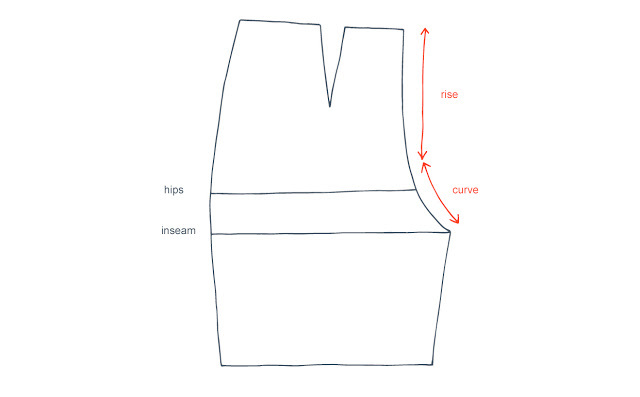 The crotch of a pair of trousers is the curved seam that goes from the waistband center front to the waistband center back. It is made of two parts : the rise (the less curved part) and the curve. You can alter the rise or the curve, or both at the same time. However, we recommend starting by altering only the rise of the crotch as it’s easier to adjust and most of the time, it’s enough to modify the few issue you might have with the inseam, seat or waist area. WHICH SOLUTION FOR WHICH PROBLEM ? 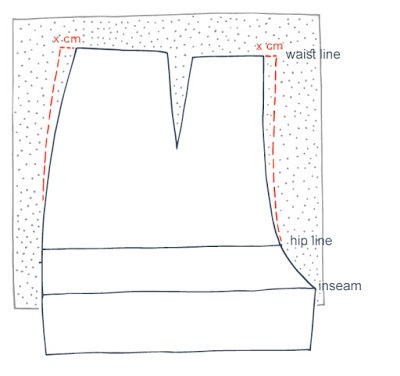 The crotch line will determine the fit of a pair of trousers. And a crotch line not adapted to your body specificities might create some issues in the following areas : seat, waist and inseam. But don’t worry ! To each problem there’s a solution. 1/ Your behind is very round (it’s too tight) : you need to widen the curve of the crotch in the back. Moreover, if the waist tends to go down when you sit, you need to add length to the crotch at the back. 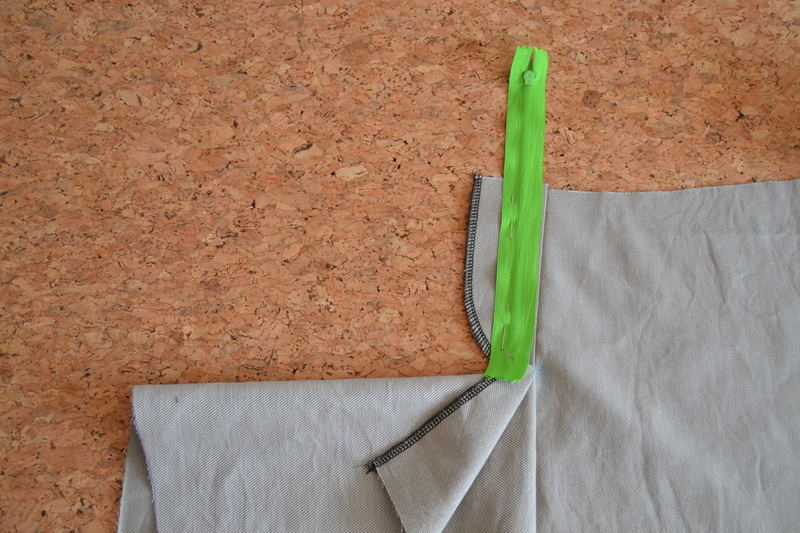 2/ Your behind is flat (there are some lines under the bottom) : you need to shorten the crotch length at the back. 3/ Your belly is round (there are some lines around the belly) : you need to lengthen the rise of the crotch at the front. 4/ Your waist is very small (there are some lines just below the waist in the back) : you need to shorten the rise at the back. 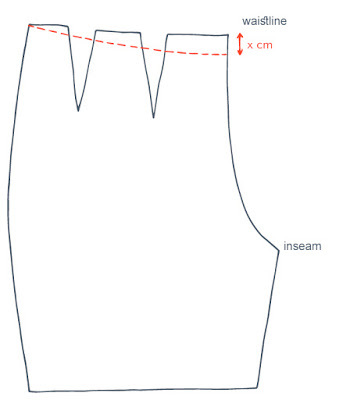 6/ The inseam is too tight (There are horizontal lines) : you need to widen the curve at the front. 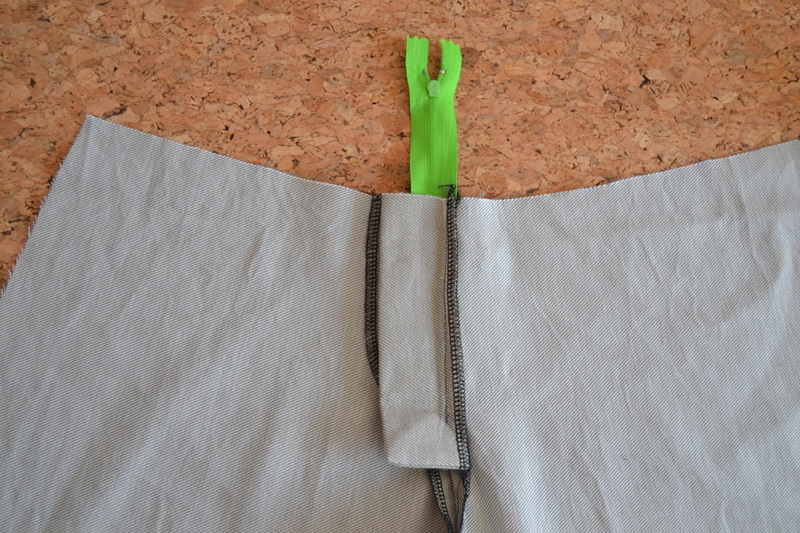 7/ The inseam is extremely tight (it cuts the legs and the waist) : you need to lengthen the crotch at the front and the back. 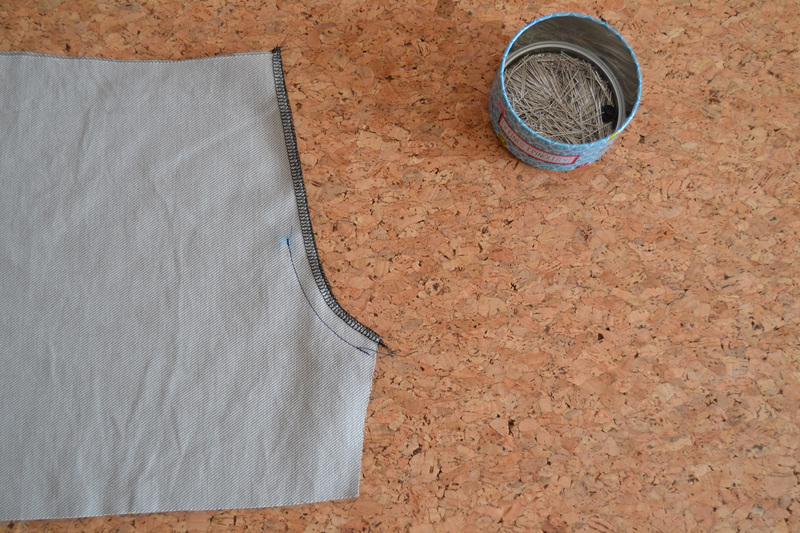 8/ The inseam is too wide (it’s too loose) : you need to shorten the crotch line at the front and at the back. 5/ If your back is really arched, there’s a chance your trousers waist will gape at the back. You need to shorten the crotch line at the back in a specific way that we’ll explain at the end of this post. 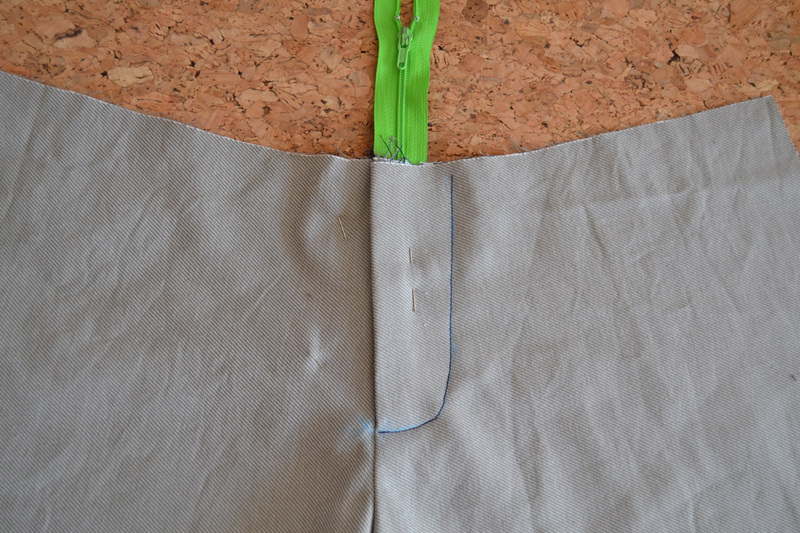 Some of the issues (nº7 and nº8) need to alter the crotch length a few cm at the front and the back. In theses cases, you’ll apply the following method (that you need to apply on the front piece and the back piece). 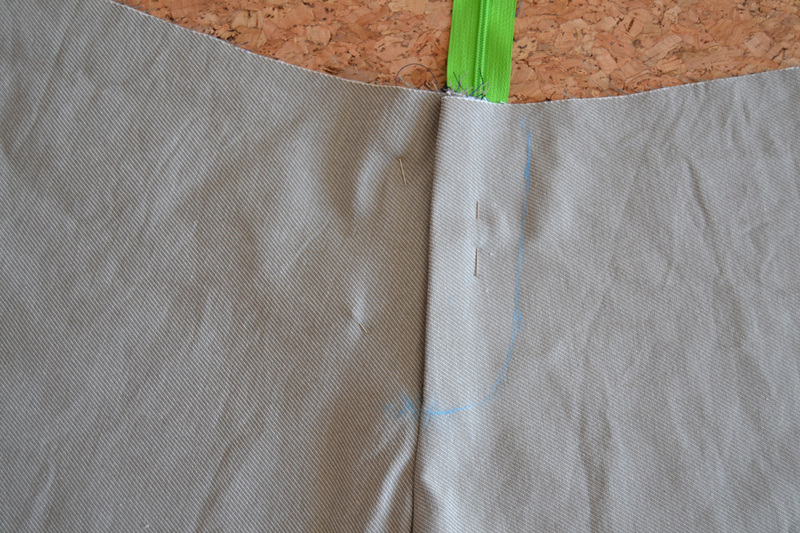 1/ Cut your pattern piece along the hip line. 2/ Place a piece of paper below the pattern pieces. Determine how many cm you need to add and add them between the two pattern pieces (make sure the pieces stay parallels). 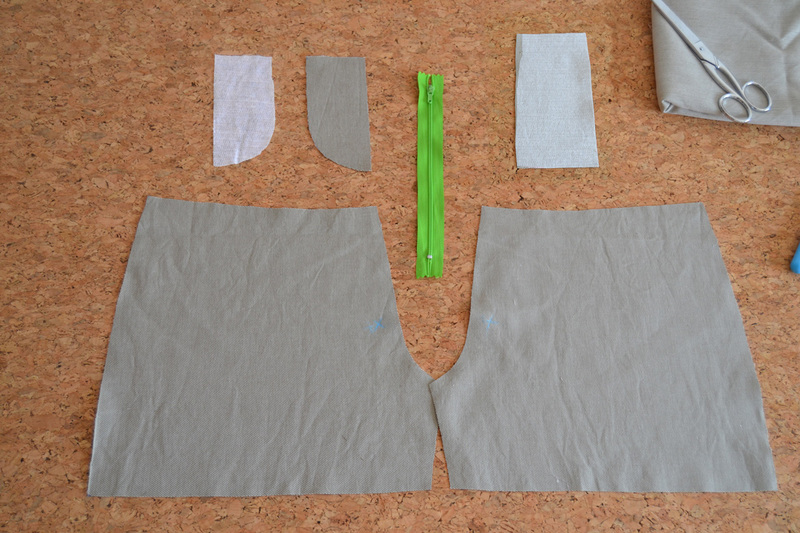 3/ Tape the pieces to the paper and redraw the curves of the crotch and the side. 2/ Determine how many cm you need to remove and overlap the two patten pieces (make sure the pieces stay parallels). 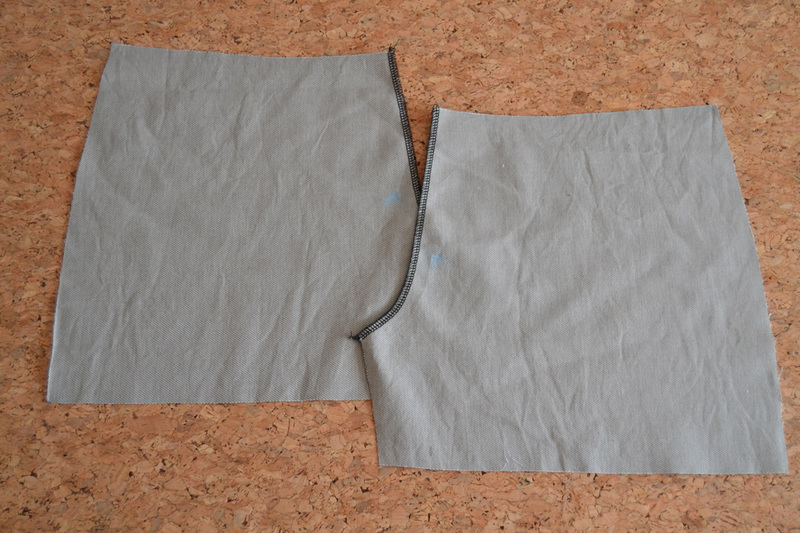 Some of the issues (nº3 and nº4) need to alter the crotch length a few cm only at the front or the back. In theses cases, you’ll apply the following method to the front piece or the back piece. 1/ Draw a line perpendicular to the grainline at the point of the dart. Cut along the line starting from the crotch but stoping before the end. 2/ Determine how many cm you need to add and spread the pieces according to the cm needed. 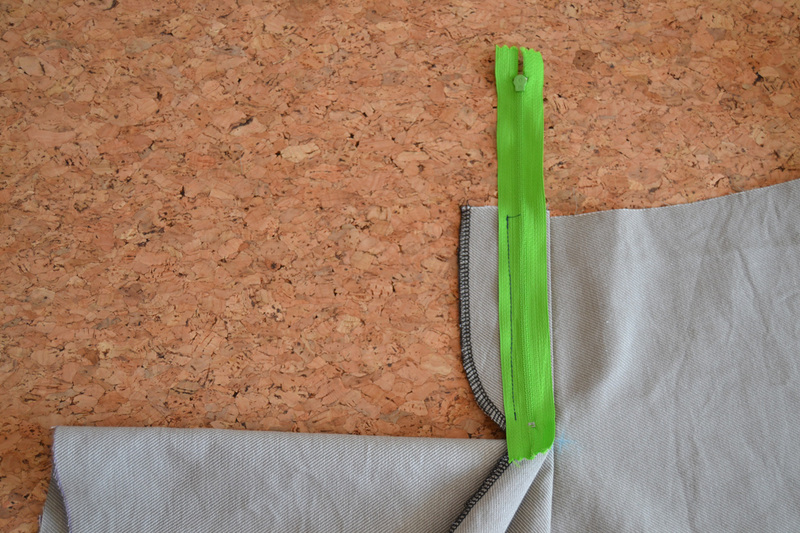 3/ Tape the pieces and redraw the crotch line. 1/ Trace a line parallel to the grainline at the deepest of the curve. Cut along this line. 2 / Place paper under the pattern pieces and spread the pieces apart according to the cm you need to add. 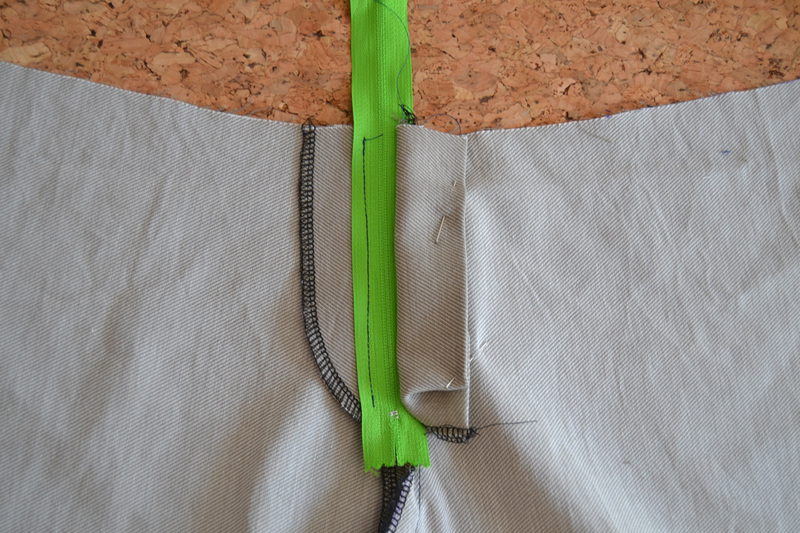 2/ Determine how many cm you need to remove and overlap the two patten pieces at the crotch. If you have an arched back and your trousers gape at the back waist, you need to alter the length of the crotch. But we’ll modify it directly from the waist. 1/ Determine how many cm you need to remove (maximum 2 cm). 2/ Lower the waist line on the crotch side. 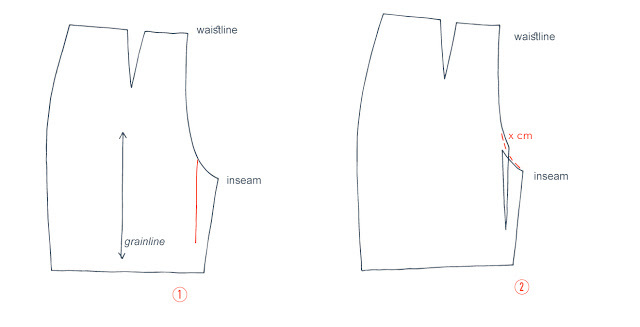 3/ Redraw the waist line with a lsightly curved line instead of a straight one. Now hopefully, you’ll be able to alter the legs or crocth of any trousers pattern to fit you perfectly ! I’m very happy to welcome the lovely girls behind Artesane today on the blog for a special post. In case you don’t know Artesane, it’s an online community platform with video classes and tutorials on sewing, knitting, crocheting, bag making, embrodery, pattern making… and many more to come. I am very greatfull to Artesane to have given me the opportunity to teach a sewing class for them on how to make a tailored jacket and I hope to repeat this amazing experience with them. Classes are only available in French for the moment but be sure to check their inspirational site just the same. 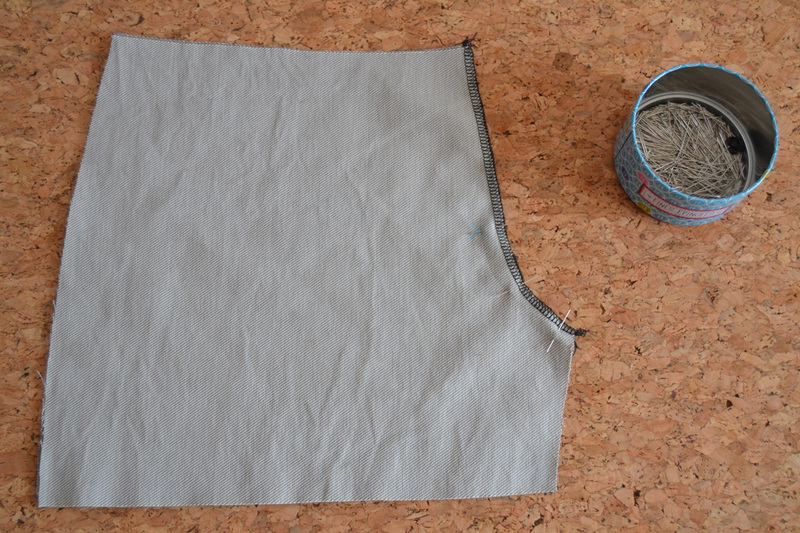 Thanks to Artesane for sharing here a great tutorial on how to alter a trousers pattern. That will be very useful for the Port trousers pattern! Let’s start! If there’s one type of pattern that’s difficult to standarize, it has got to be trousers. Everybody has got different body types and it’s quite rare not to have to alter a trousers pattern. That’s why we often have a favorite store-bought trousers brand or model ! It’s not easy to find a ready-to-wear model that fits perfectly at first try. The best thing would be to make a muslin for every model that you like and think could be a go-to pattern. 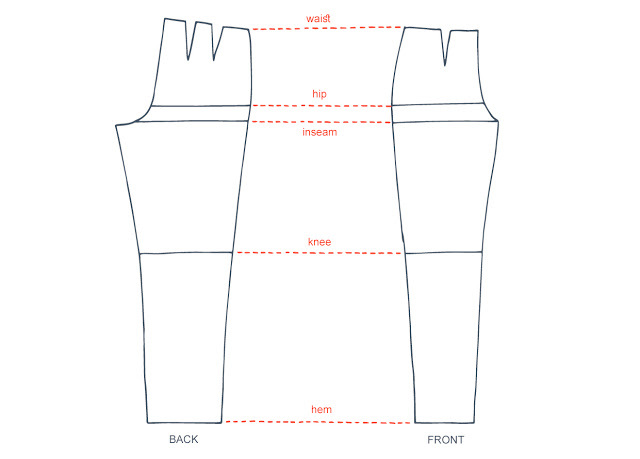 Once this pattern is altered and fitted, you’ll have a tailored trousers pattern and will be able to use it again and again ! How is made a pair of trousers ? Trousers are made of two legs, a waistband and a type of closure (a fly for example). Each leg is made of a front piece and a back piece. The back pieces is usually bigger than the front one. The back crotch is longer and curvier (that’s where our bum goes !). 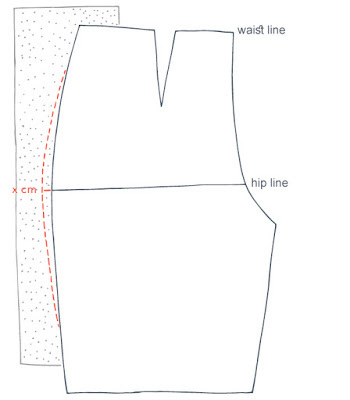 Once you’ve added these lines to your pattern, it’s time to alter the trousers leg (there’ll be a second post on how to alter the crotch as it’s a vast subject). 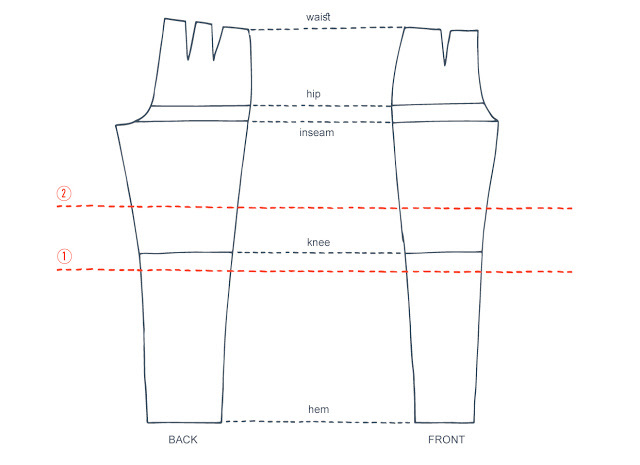 The technics used to lengthen or shorten a pattern piece are the same for any kind of garments. But still, let’s have a little reminder. 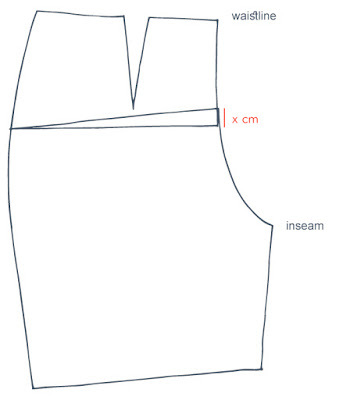 HOW TO SHORTEN A PATTERN PIECE ? 1/ You need to determinate how many cm you need to remove. Above the shorten/lengthen line on the pattern, trace a parallel line at X cm. 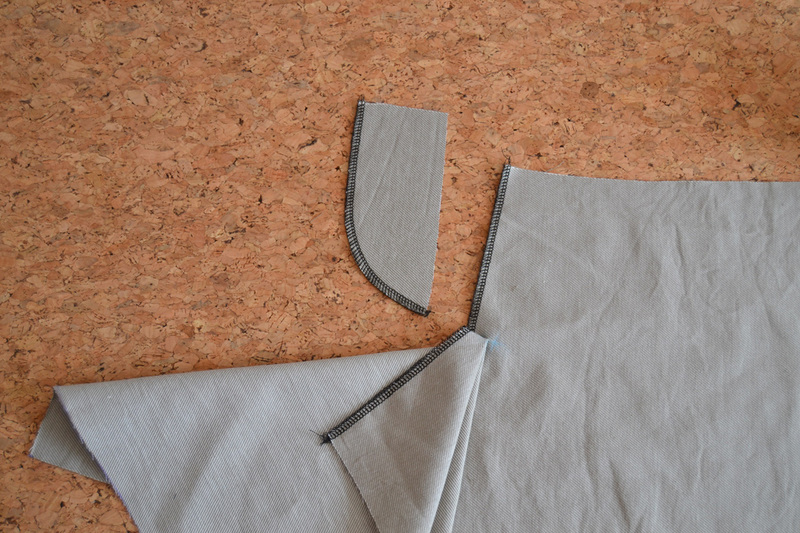 2/ Folding the pattern piece, overlap the two lines. 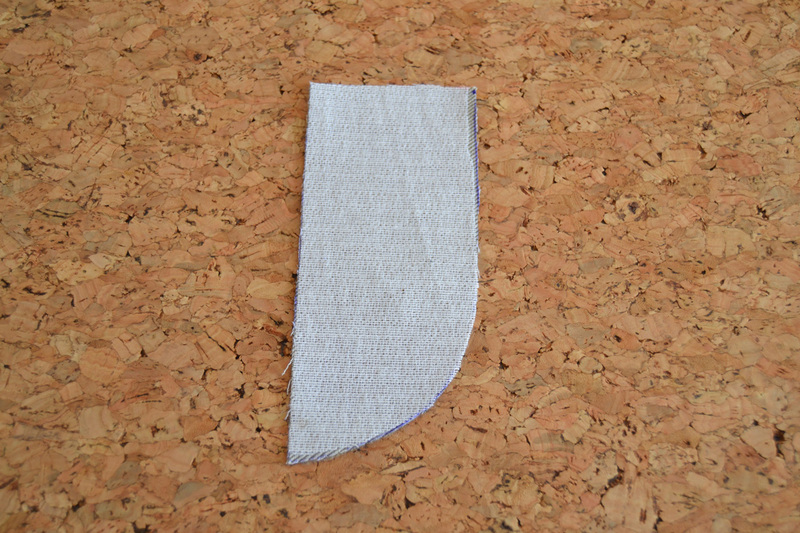 3/ Tape the fold close. HOW TO LENGTHEN A PATTERN PIECE ? 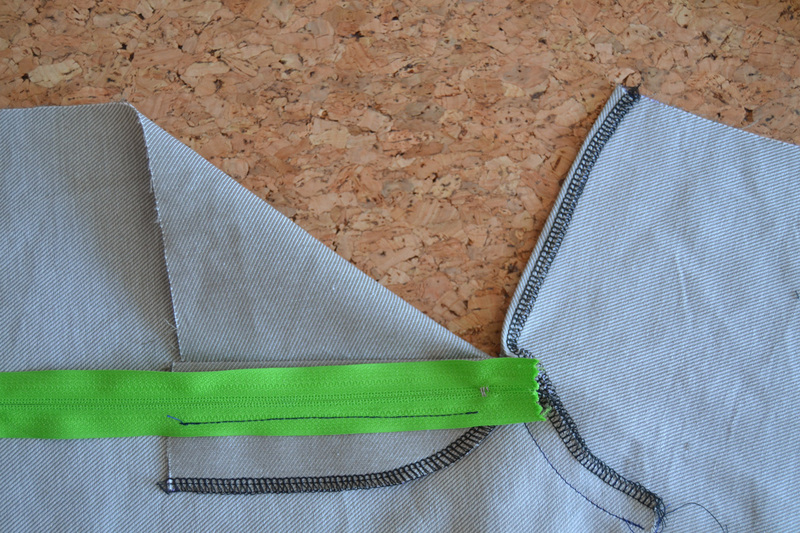 1/ Cut the pattern piece along the shorten/lengthen line. 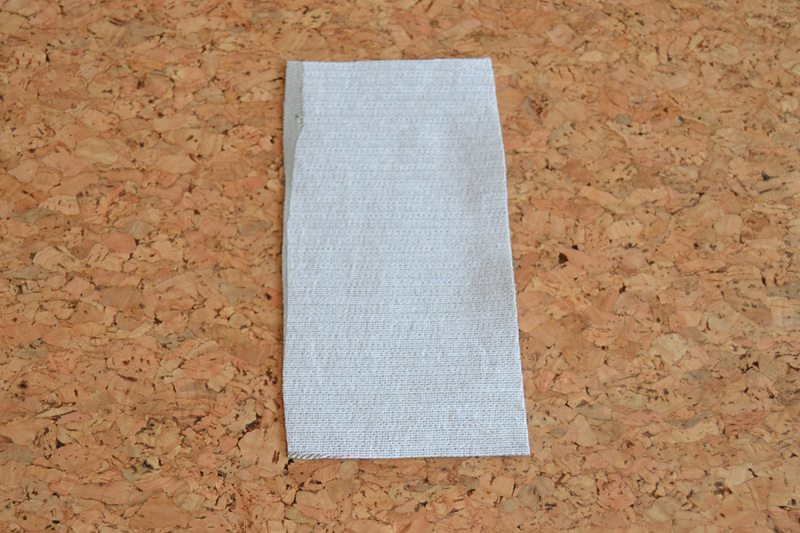 2/ Place a new piece of paper below the two pattern pieces. Determinate how many cm you need to add and spread the two pieces apart X cm (make sure the lines stay parallel). 3/ Tape the two pieces to the paper and join the two pieces together. Now that we’ve seen the techniques, the important thing is to know where to apply them. Indeed, if you were to lengthen a trousers leg at the wrong place, there’s a good chance the general shape will get distorted. 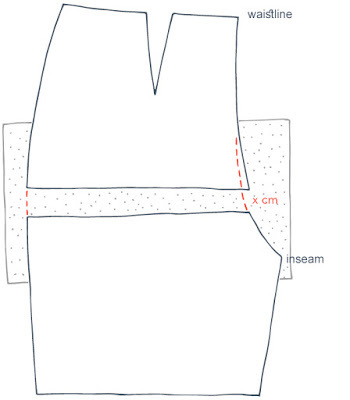 1/ If the shortening/lengthening is small (up to 3 cm), the line has to be placed just above the knee (line 1). 2/ If the alteration is more important, it needs to be made in two places. Divide the length you have to add or remove from the leg in two. Then draw two adjustment lines above and below the knee (line 1 & 2). 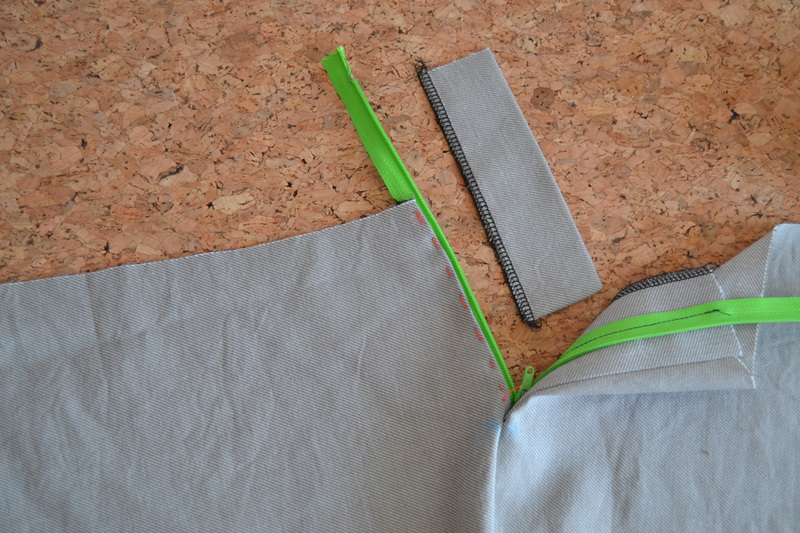 If the alteration is minimal, you can do it at the hem line. The secret of a great waist adjustment resides in distribution ! The more you distribute evenly the cm you have to add or remove, the less you’re going to change or distort the shape of the trousers. And this is even more true if the adjustment is important ! You’re going to add or remove the cm needed on both sides of each front and back leg, meaning at 8 different places ! HOW TO WIDEN THE WAIST ? 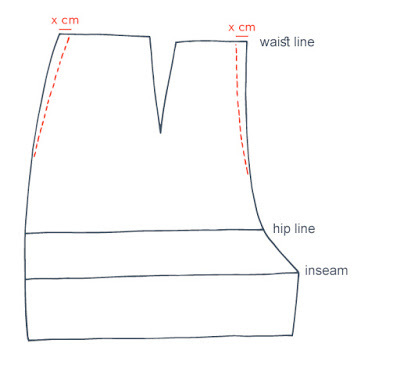 1/ You need to determinate how many cm you need to add at the waist. 2/ Divide by 8. The end result is X cm. 3/ Place some paper below your pattern piece. 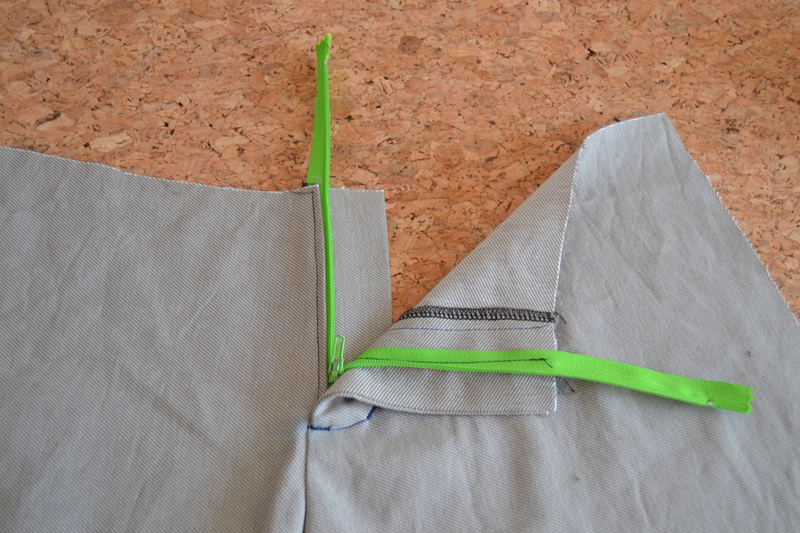 4/ Extend the waist line on both sides of the pattern piece. Add X cm to both sides (see diagram below). 5/ From these marks, trace the new stitching lines joining gradually the existing ones. The key is to draw progressively the new line so that we don’t get any « bump ». HOW TO TIGHTEN THE WAIST ? 1/ You need to determinate how many cm you need to remove at the waist. 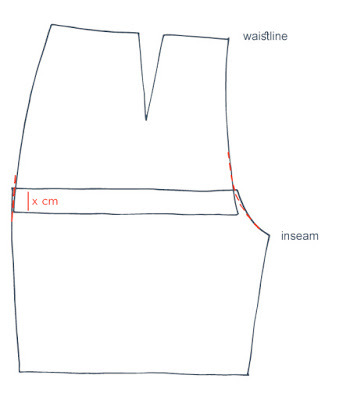 3/ At the waist line, remove X cm on both sides of the pattern piece (see diagram below). 4/ From these marks, trace the new stitching lines joining gradually the existing ones. The key is to draw progressively the new line so that we don’t get any « bump ». Again, the secret of a great hip adjustment is in distribution ! The more you distribute evenly the cm you have to add or remove, the less you’re going to change or distort the general shape of the garment. And this is even more true if the adjustment is important ! You’re going to add or remove the cm needed on both sides of each front and back leg, meaning at 4 different places ! HOW TO WIDEN THE HIPS ? 1/ You need to determinate how many cm you need to add at the hips. 2/ Divide by 4. The end result is X cm. 4/ On the exterior side of the leg, we’ll extend the hip line a few cm. Add X cm (see diagram above). 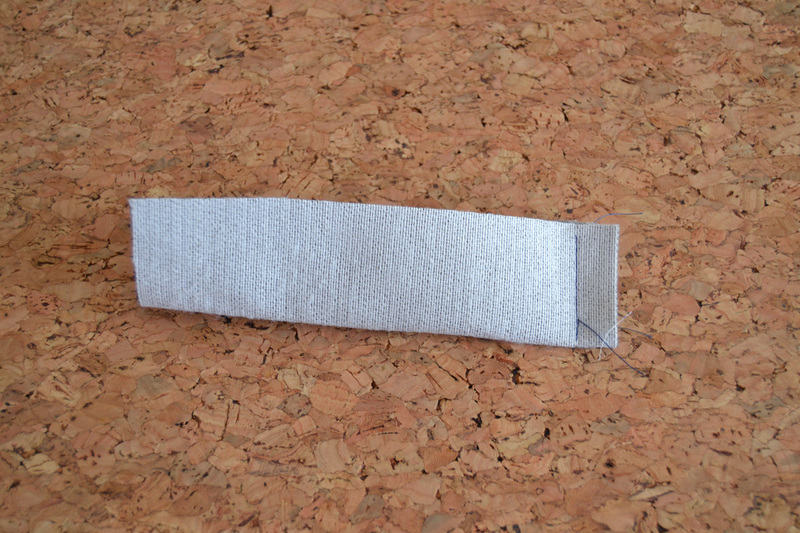 5/ From this mark, trace the new stitching line joining gradually the existing one from waist to hem. The key is to draw progressively the new line so that we don’t get any « bump ». 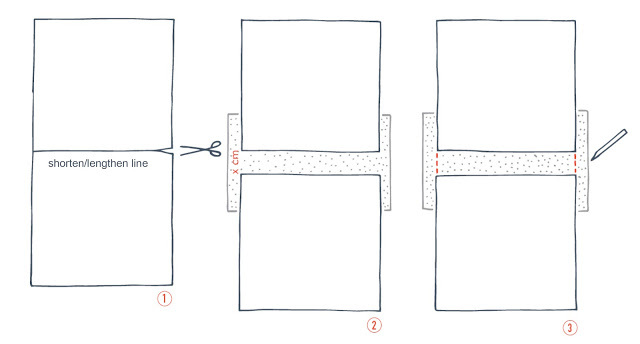 Be careful, if the trousers have a straight leg, you have to join the new hip line to the waist but you should extend the leg in a straight line to the hem, parallel to the previous stitching line. HOW TO TIGHTEN THE HIPS ? 1/ You need to determinate how many cm you need to remove at the hips. 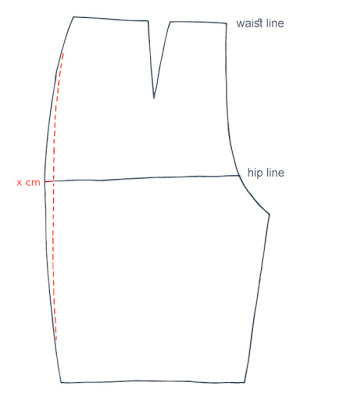 3/ On the exterior side of the leg, we’ll remove X cm to the hip line (see diagram above). 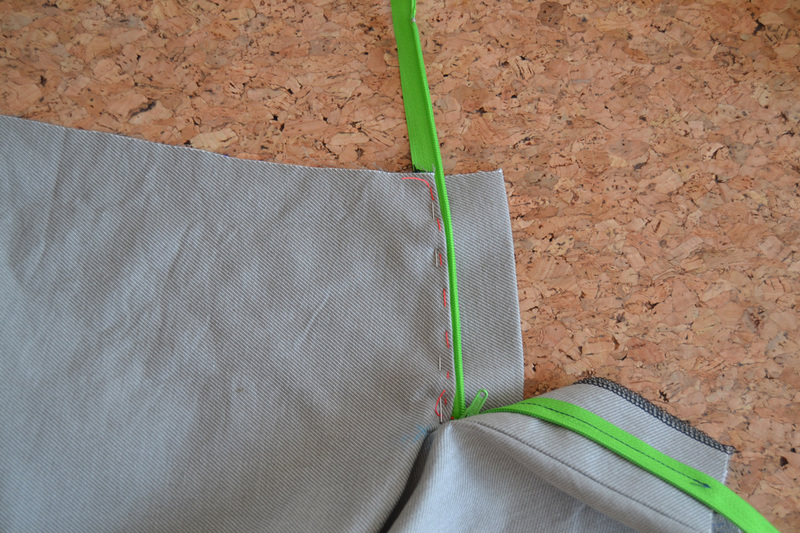 4/ From this mark, trace the new stitching line joining gradually the existing one from waist to hem. The key is to draw progressively the new line so that we don’t get any « bump ». 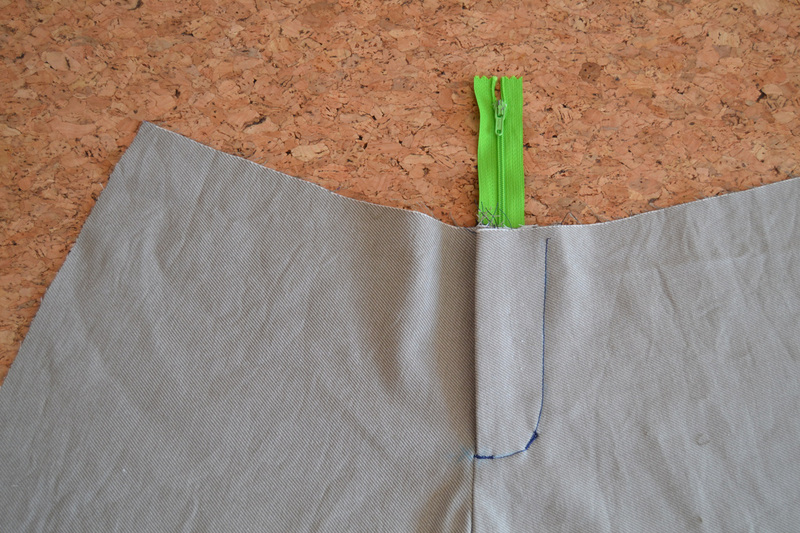 With these techniques, you’ll be able to adjust the legs of your favourite trousers pattern (length, waist or hips) ! We’ll see how to adjust the inseam and the crotch as well as how to alter the seat very soon. And because it’s always easier to get inspiration for a project when you’ve seen a few versions made in different fabrics and worn by different people, let’s review some of the testers’ Port trousers. As you can see, denim has been a favourite amongs the testers. You can play with contrasting topstitching to give your Port trousers a jeans style or keep it casual. Just remember than denim has a tendency to stretch when worn (going down a size might be a good idea. My shorts version is perfect on the first day but a little too big on the following one for example). 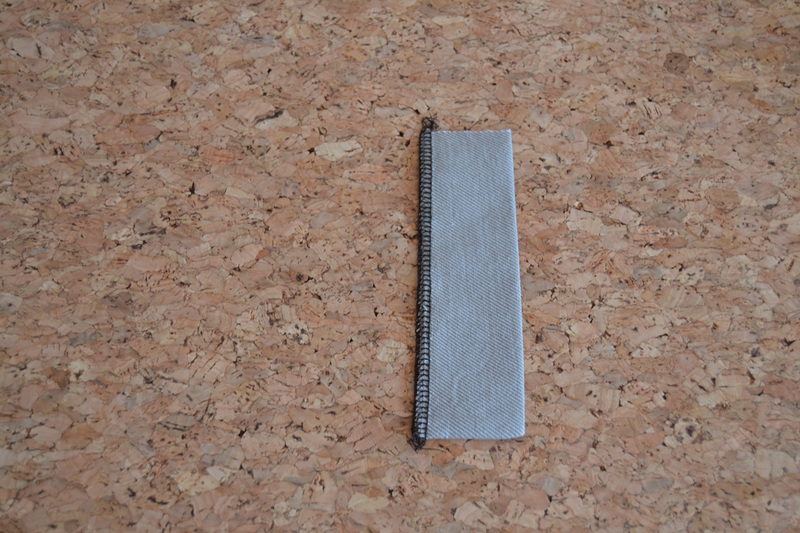 If you want a more dressed-up version, you can use gabardine, cotton twill or chambray like these testers. 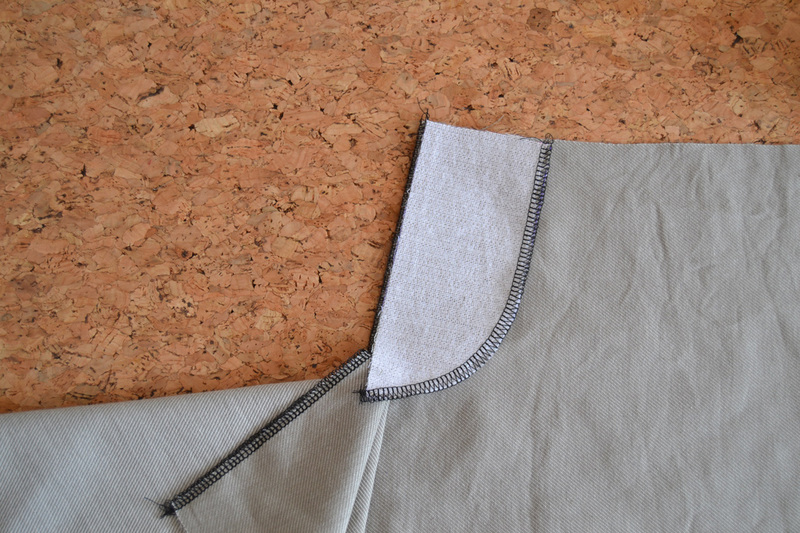 I think the Port trousers are really easy to wear (and sew by the way!) and it’s the kind of garments you can wear from day to night depending on how you accesorize. I hope all these beautiful Port trousers will give you some inspiration. If you want more, check out the Port trousers & shorts board on Pinterest. 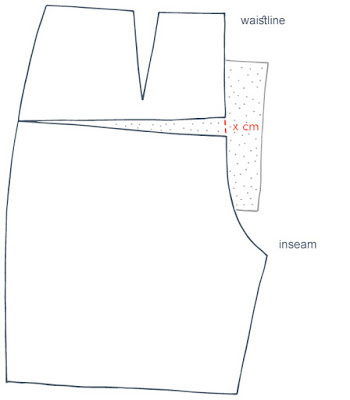 Here it is, the new pattern: the Port trousers and its short version. Its casual look will be perfect for the back at school/work season or the ones who don’t want to say good-bye to summer. The chino cut, military inspired, makes it perfect all year-round. How about wearing view A with cuffed hems and heels for work or view B to make the most of the last summer days? The Port trousers have a relaxed fit at the waist and hips with a slightly tapered leg and ankle length, as well as a mid-rise waistband with belt loops. There are many pockets options (you all know my love for pockets by now, no? 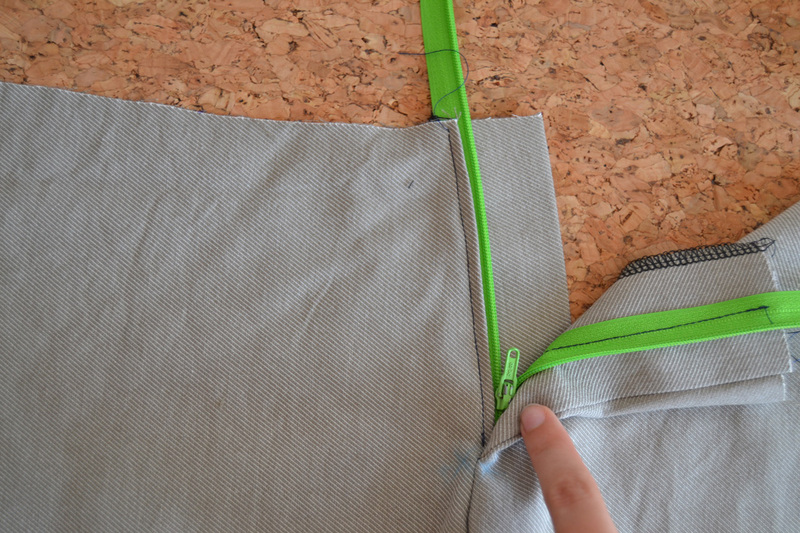 ): view A with front slant pockets and back patch pockets, view B with front patch pockets and back zipped pockets. I recommend using medium-weight fabrics such as gabardine, twill cotton, linen, denim… or even lightweight woolen fabrics for a more dressed-up version. The Port trousers pattern is available at the shop only as a PDF download. 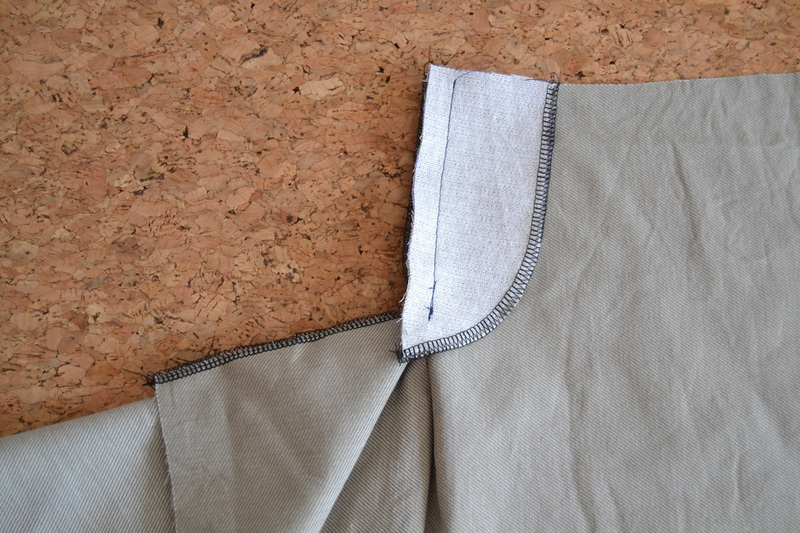 I’m preparing a series of posts on trousers common adjustments, inspiration and a few tutorials in the up-coming weeks. I hope you’ll like the Port trousers and that it will join your fall wardrobe!